For the past couple years we've been following the Skyla Burrell Blues Band - seen them in Florida and Baltimore - but never at a regular stop in their touring schedule: Adams County Winery. 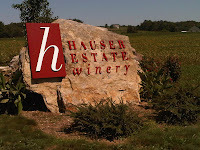 Perfect for MyJoogTV; an awesome blues band and a venue that produces wine; but not the wine we are accustomed to in northern Virginia. Since 90% of their customers prefer sweet wines, that is the style the winery produces. There are some dry and off-dry wines to appease the owner's palette - as well as any other dry wine drinkers who visit - but the majority of wines range from semi-sweet to sweet. The grapes are not your typical vinifera varieties either. Yea, there's a Cabernet, a Chardonnay, and a Riesling; but most wines are made from native labrusca (niagara, concord, catawba, cayuga); hybrids (vidal and traminette); or fruit. For our tasting with the Skyla Burrell Blues Band, owner John Kramb chose their three best selling wines: Tears of Gettysburg (majority Niagara); Rusty's Red (Concord and Niagara) and Scrapple - a sweet cranberry\apple wine. Yes the wines were sweet; but not sickly so - just enough to enhance the fruit flavors. 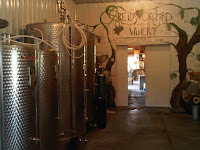 We also learned the production process in order to make sweet wines and we discussed the blues. Then we sat and listened to a great set - all original rockin' blues. Since we don't make it out to Adams County too often we left before the second set to explore two other wineries in the region. 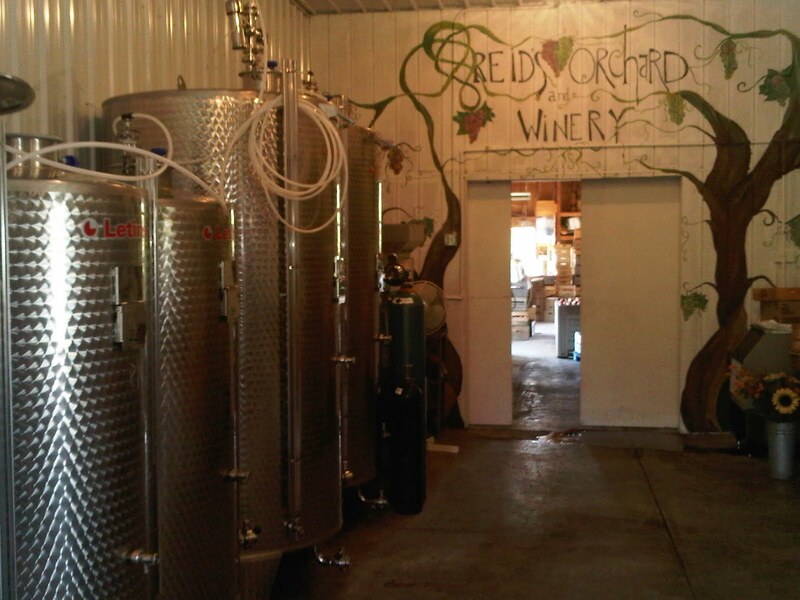 The first was Reid's Orchard & Winery - new to the wine business but an operating orchard for the past 35 years. 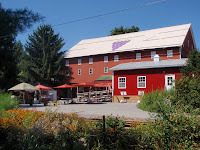 Some of the grape varieties were similar to those at Adams County Winery - but there was more viniferia - Pinot Noir Syrah, Zinfandel, and Sangiovese. And better yet, Mr. Reid blends these - not many single varietal reds available. That's what we like to see. And they are not bad al all - try the Trioka or the Reid's Red. 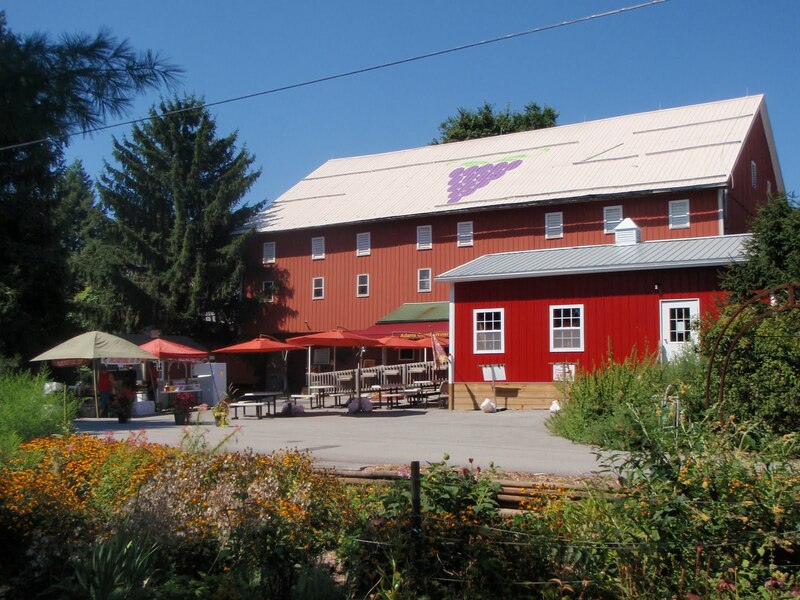 And like Adams County Winery - they have a satellite tasting facility in downtown Gettysburg. We intended to head to Appalachian Brewing Company in downtown Gettysburg - but saw a sign for Hauser Estate Winery. Why not. This is another new winery which we were vaguely familiar since the Skyla Burrell Blues Band plays at the venue on some Friday nights. And these must be fun nights - the view is fantastic - overlooking the historic Round Barn and the rolling hills into Gettysburg. Since we had one more stop, we limited our tasting to the ciders and lower end wines; the premiums will wait another day. The ciders were excellent - particularly those blended with multiple apple varieties. The wines - a little disappointing. Most were single varietals that lacked flavor and depth. Maybe we should have gone directly to the premium list. But we will be back one night when Skyla's on the patio. We finally made it into Gettysburg and rolled in right next to General Lee's Headquarters. 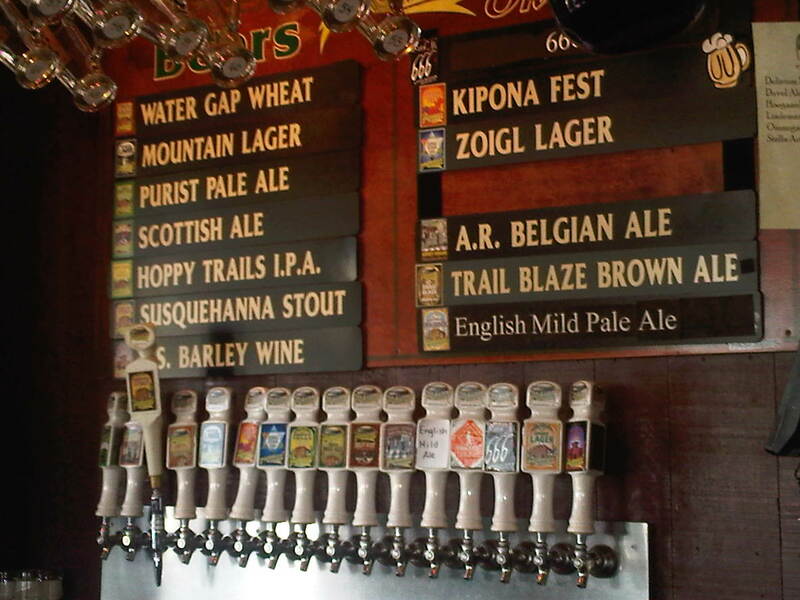 That's the location for the Appalachian Brewing Company. We had intended to head north into Harrisburg to their main brewery - but decided a shorter trip was more prudent. And the beers are the same - brewed in Harrisburg and shipped south. We chose a sampler - eight beers - which gave us a good representation of the brewery's portfolio. Interestingly we enjoyed all but the seasonals - threw them back. 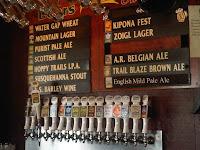 But the main line is good - just what you would expect from each style - except for the Pale Ale. That beer has subtle hops - which allows the malt flavor to dominate - no west coast pale ale here. But their IPA is the hop bomb and really cleans the palette. If trying multiple beers - be warned - drink this last or else the lighter beers will taste bland. When in fact, the lighter beers are perhaps the strength of their styles. The lager has more flavor then any lager we've had previously and the hefe - is quite nice. We look forward to heading all the way into Harrisburg - that's where the music is - and a hotel.